OdorKlenz Absorbent Granules are perfect for cleaning up liquid mishaps that you might meet throughout the day. The superabsorbent granules not only soak up the mess so it’s easier to clean, but it uses the OdorKlenz patented earth mineral technology to eliminate the odors at the source. Great for treating liquid messes, including urine, vomit, diarrhea, household chemical spills, blood, garbage spill, and food spills. Don’t bother with harsh chemicals or laborious scrubbing. 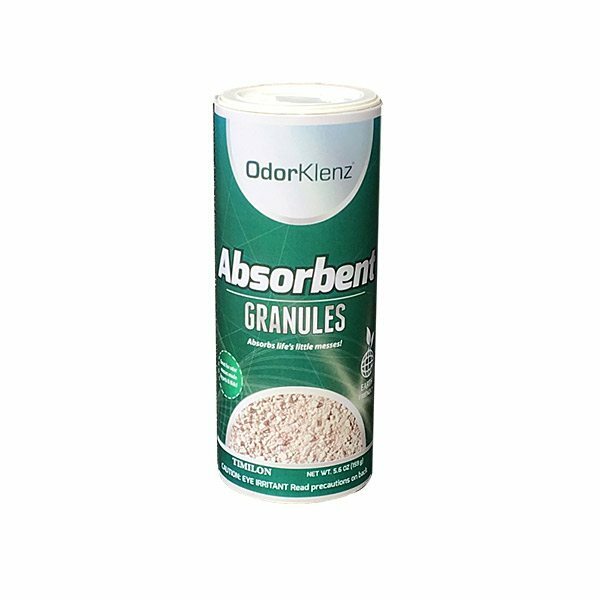 On top of its effectiveness, OdorKlenz Absorbent Granules is simply too easy to use. That’s it! With OdorKlenz you just sprinkle and walk away while it does all the work for you. Vacuum it up and forget it ever happened! We just wish every problem were so easy to handle. When Fido think’s your closet is a patch of grass? Sprinkle with OdorKlenz. When potty training gets real? Sprinkle with OdorKlenz. Did the kids traipse through the house after exploring every mud puddle in the backyard again? Sprinkle with OdorKlenz to remove the stains and your frustration. Stomach bug wreaks havoc? OdorKlenz has you (and those unseemly messes) covered. For life’s little messes, reach for OdorKlenz Absorbent granules and get back to living! 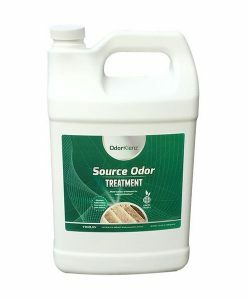 Locate the source of odor and clean and remove waste. Sprinkle OdorKlenz Absorbent on vomit area and let sit for 10 minutes. You will notice immediately that the OdorKlenz Absorbent begins to remove the vomit smell from the carpet and restores the area to its original condition as if nothing ever happened. For bar or restaurant owners, OdorKlenz Absorbent can be used for that emergency and unexpected cleanups that happen occasionally. Just apply OdorKlenz absorbent directly on the affected vomit area and let sit for 10 minutes then come behind and sweep it up. Get rid of vomit odors fast without offending other guest and patrons and do so without the use of masking agents or fragrances that can sometimes make the situation worse. Safe to use around your pets and leaves the area as if nothing ever happened. Make OdorKlenz Absorbent a part of your normal cleaning routine for your restroom areas. Just apply the OdorKlenz Absorbent on the restroom floors and immediately begin to remove offending urine odors at the source. The OdorKlenz Absorbent Granules is not quite fairy dust, but it comes close. Sprinkle a generous amount on any liquid spill and watch the magic happen! Perfectly safe for use around your home or business, this incredible absorbent granules will become your go-to when life gets messy. 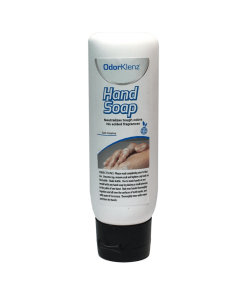 As always, OdorKlenz is committed to a limited list of safe, effective, fragrance-free and non-toxic ingredients which have been formulated and tested to neutralize the most stubborn odors. With the OdorKlenz patented earth mineral technology, you can have the peace of mind to use the OdorKlenz absorbent granules in your home and the confidence in knowing it will get the job done. 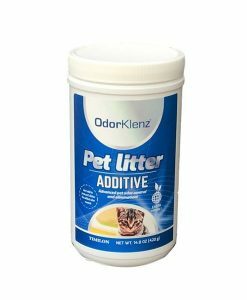 Safe for use around children and pets, OdorKlenz Absorbent granules immediately neutralize bad odors and works at absorbing liquid spills and mess, so you don’t have to get on all fours and scrub. Own a business? Use OdorKlenz Absorbent Granules to quickly and discreetly clean up spills and liquid mess, so your patrons never see them. Sprinkle OdorKlenz in your bathroom at home or work to eliminate that persistent urine smell. Your family, your guests, and your customers will all be impressed by the cleanliness and hospitality OdorKlenz allows you to provide. Use in your car to make road trips more enjoyable with children and pets. 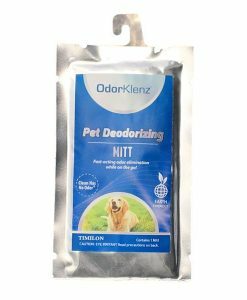 Ideal for pet owners, bar or restaurant owners, veterinary offices, day cares, and transportation companies for safe and easy clean-up. Click here to learn more about how to use the OdorKlenz Absorbent Granules. OMG! These are 3 words I use rarely. I live in Australia and this product is not available here so I purchase online from the states. I regularly use the cat urine remover (very naughty cat but we love her) and have just discovered the sports powder and the absorbent granules. All these products are amazing and do exactly what they advertise. The granules I bought are wonderful in the bottoms of my trash containers…no more odors at all! Thanks OdorKlenz!! The Absorbent Granules worked like a charm. I had a professional cleaning company come to clean my carpets. However the cat urine smell still remained until I used OdorKlenz. It took the smell completely out of the carpet. Our power was out for a week following Hurricane Irma. Everything spoiled in our fridge and the fridge/freezer had an awful rotten smell. Luckily, I had some OdorKlenz Granules on hand. I put some of the granules into a clean sock and placed it in the fridge. It completely removed the smell!! This works just as I remembered it did when I owned a business and often found the cleaning up my bar late hours after folks who had too much to drink. Works like gangbuster on vomit odors!! I work at a pretty large day care center and between throw up, urine accidents, and diaper pails our place can smell like a hot mess. we have been purchasing these granules by the case and using it on whatever accident pops up that day with great success. If you were to ever be compelled by a review please let it be this one. If you have musty smells or odor issues on carpet go right ahead and Buy this!! All you have to do is place the granules in a bowl or directly onto the source of the odors wait an hour and be prepared to be amazed. I have never seen anything like this. The product can be used to clean up a variety of liquid spills that give off an odor. This can include household chemicals, vomit, urine, and many other things. Just directly apply the product and allow it to soak up and solidify the liquid. This process will neutralize the odor. The spill can be swept up for disposal. Can I use this on old urine odors? Absolutely. The product is very effective against urine odors. Is this product safe to leave on my carpeting to remove odors? Is this safe to use in my cat litter box? It depends on the spill, but we recommend apply enough product to solidify the liquid. Is this safe to use in diaper pails and garbage cans? Yes, the product can be used in those applications effectively. Is this product fragrance-free and non-toxic? How long will it take to remove an odorous liquid spill? The products works fast. Apply enough to soak up the liquid and the odor will be quickly reduced and eliminated at the source.